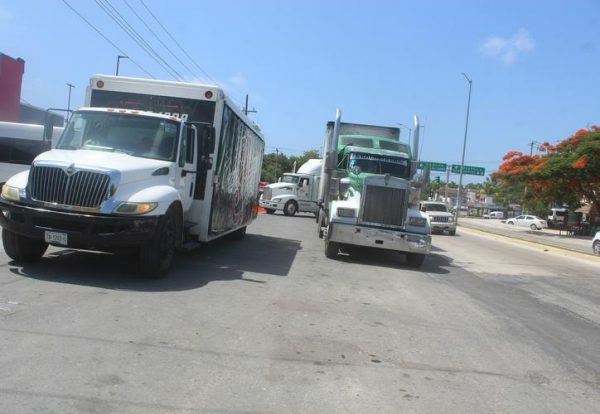 A section of the Tulum-Cobá road is used as a parking area for double trailers and heavy cargo trucks that come or go from Yucatan, obstructing the road. In this regard, the traffic director, Hafit García Miranda indicated that the situation in that highway needs to be addressed by federal, state and municipal authorities. The road between Cobá and Ok’kot Avenues is practically occupied by all these heavy vehicles and, given the limited space, this situation creates traffic jams, and difficulties during the peak hours. This has also led to the deterioration of the asphalt. Hafit García Miranda says that almost the same situation is observed in all the roads entering and leaving the Tulum city limits. Fact is that these double-trailer units are not just staying overnight. but spending the whole day parked in the area. Is Tulum going in the right direction?